Issued in a gatefold sleeve with plain white paper inner sleeves. 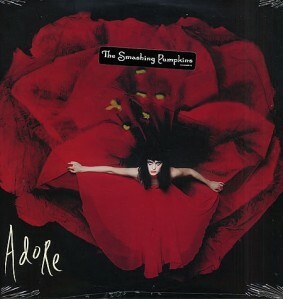 Affixed to the front cover is a black sticker with white lettering which reads “The Smashing Pumpkins 7243 8 45879 1 8”. Some copies have an alternative barcode sticker affixed over the printed barcode. All songs published by Chrysalis Songs / Cinderful Music (BMI). Mastered at Masterdisk. (P)&(C) 1998 Virgin Records America, Inc. and The Smashing Pumpkins. Matt Walker appears courtesy of DreamWorks Records. Some later pressings came with a UPC barcode sticker affixed to mask the original printed barcode. X̶X̶X̶X̶X̶X̶-̶X̶ in the matrix for side three represents indecipherable text which has been scribbled-out and not struck-through.